THE CAUCASUS MOUNTAINS are a spine of mountains that extend for over 1000 km roughly East to West, between the Caspian and Black Sea, a natural obstacle between the plains of Russia and the mountainous territories of Transcaucasian. They are covered with wild forests and flowers. 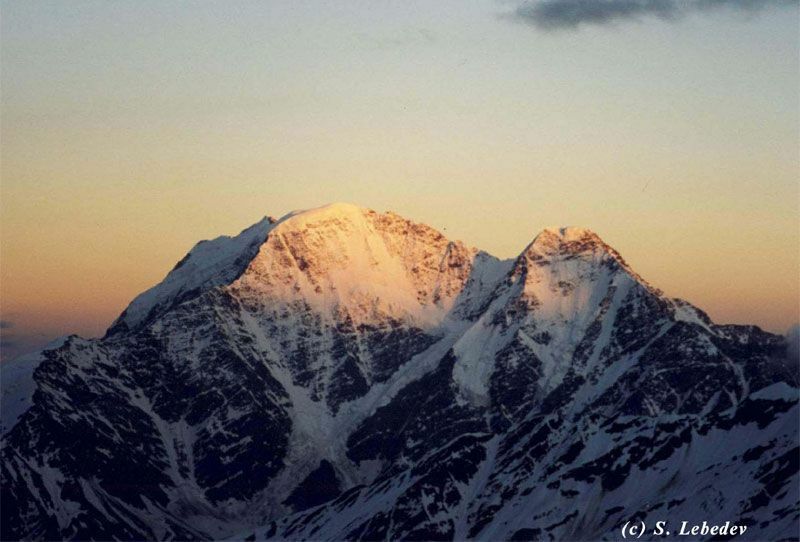 The Caucasus region has a mountain system that includes many peaks over 4,000 meters high and hundreds of glaciers. THE CENTRAL CAUCASUS, in the heart of the Caucasus, is the highest part of the entire mountain system. 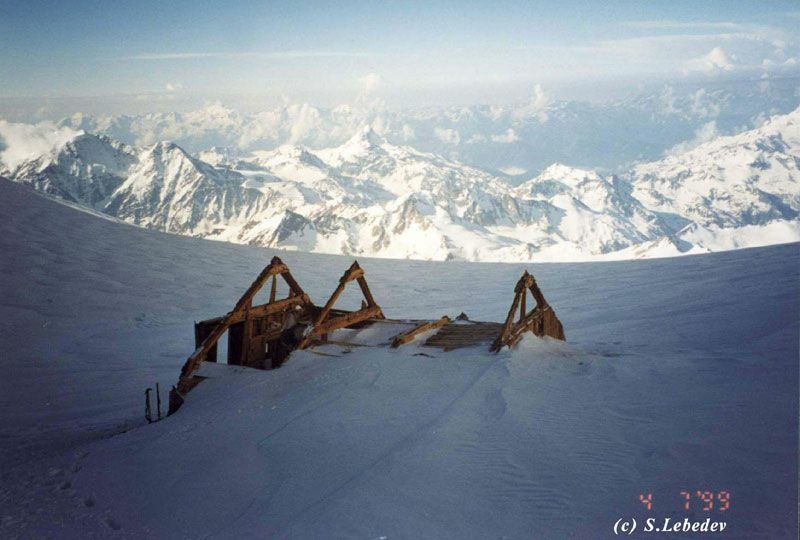 Hard to access to the west because of Mount Elbrus and to the east by Mt. Kazbek, the central section branches off to the north and south into a series of complicated geological buttresses. PRIELBRUSIE, the area around Mount Elbrus is a highly frequented area in the Central Caucasus reigon where many valleys converge into the Baksan valley, where the river flows. In this region you will find many legendary peaks such as Mt. Shkhelda (4,320 m), Mt. Chatin (4,368 m), Mt. Donguz-Orun (4,468 m), Mt. Ushba (4,710 m), and Mt. Elbrus itself (5,642 m), the highest peak in Europe. The area is easily reached from Mineralnye Vody with a good network of roads and the journey takes about four hours. MT. 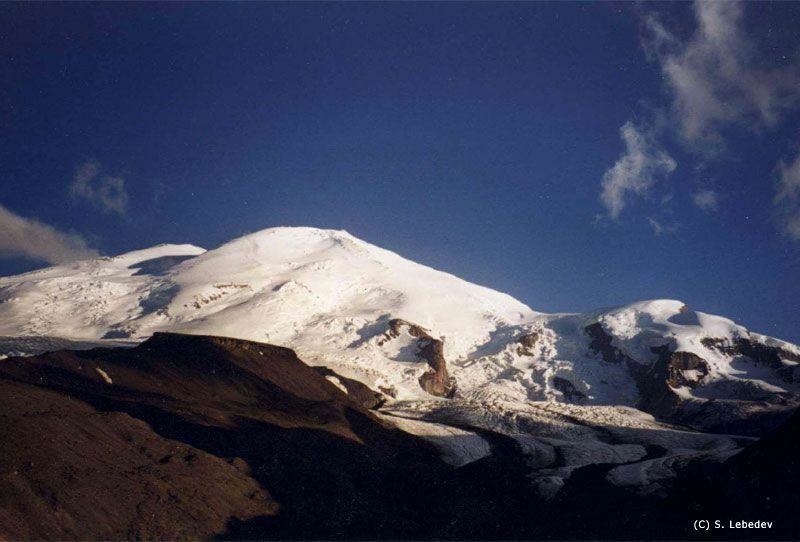 ELBRUS dominates the Central Caucasus and has two which were originally separate volcano vents: the western peak (Zapadnaya) is the higher peak; the eastern peak (Vostochnaya) at 5,621m, has a crater 250m in diameter. The mountain is covered by a huge sheet of ice which covers some 145 sq kms and is reputed to be up to 400m thick. Often ferocious weather surrounds the mountain and there is permanent snow and ice cover year round. From the col that divides the two peaks the snow slopes descend to tongues of ice and crevasses lying in the many valleys that radiate from the mountain. THE CLIMB OF MT. ELBRUS by the normal route is a longish climb over a medium incline that requires good acclimatization but has no objective technical difficulties. The apparent simplicity of this route is deceptive though because it can be dangerous. Apart from the altitude, the highly variable weather and frequent violent storms combined with low temperature means that this ascent is a real high altitude adventure! The prevailing weather approaches in a Westerly direction and each season people are frequently caught out on the high flanks. The average time to summit is from eight to ten hours for the ascent and about four hours for the descent. Crampons and ski poles are necessary for this climb and ixe aces are useful for training purposes and extra safety. In autumn, winter and spring the incline above the Pastukhov rocks is covered with ice and can be dangerous. The summit plateau is itself is large and featureless and surrounded by steep drops. April, May and June are the best months for a ski descent, mainly from the col since there is a steepish traverse from there to the summit plateau. А. Лебедев "Взойти на Эльбрус"